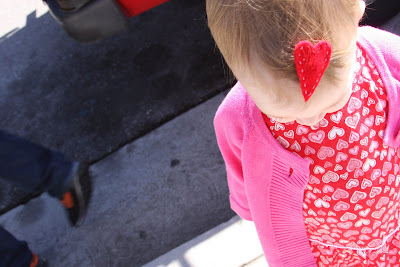 we had fun getting ready for valentine's day this year. 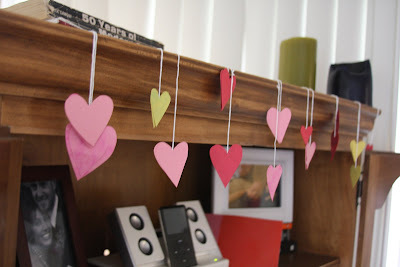 we cut out paper hearts and hung them all over the house. 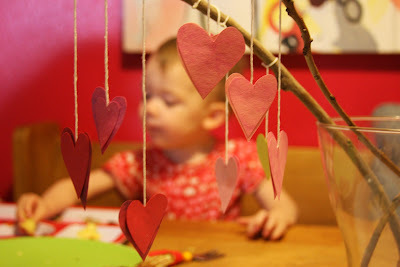 i wasn't quite sure when you can start decorating for valentine's day, as i have never decorated for or even thought about decorating for valentine's day. i know as the girls grow they will have fun getting the house ready with me, so i decided this year was as good as any to start our little traditions. 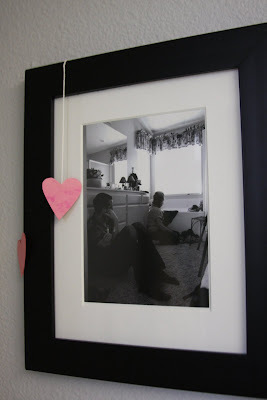 we hung little hearts over a few extra lovey photographs in our home. this one is of our wedding kiss. this is one of my very favorite photos in the whole world. my best friend lindy took it of us when i was in labor with mary. i am in the tub in the background, with my midwife next to me. i love kirby's mood in this picture. he is quiet and contemplative, anticipating what is happening. it makes me remember how deeply connected we were in those moments even though at times we were in different places physically. it also makes me remember how quiet and beautiful the room felt to me. it's definitely a picture of love. 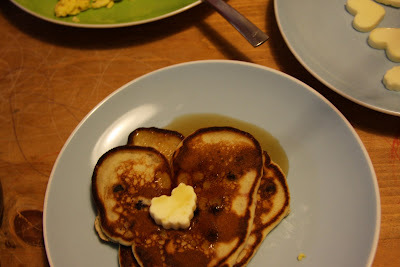 aside from all that gushy stuff, we had a yummy breakfast of heart shaped blueberry pancakes and scrambled eggs. we even had heart-shaped butter, a last minute "a-ha!" moment when i found some old heart shaped cookie cutters in my messy kitchen tools drawer. hero dipped everything in syrup and ketchup, alternately. 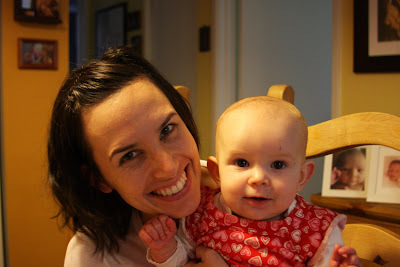 me and the beeps, in her valentine's day best. we went for a hike with my parents through this awesome forest in sierra madre. 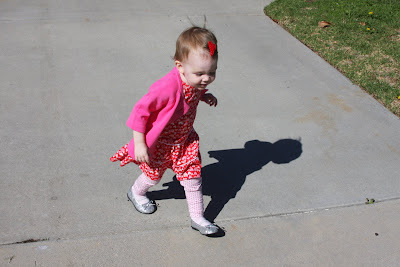 here is hero running to the car in her totally hike-appropriate heart dress. she even has enough hair now for a barrette, which i forced upon her. this is one of my latest crafty creations, too. super cute. i even got a coupon for a "free" 30 minute massage*. in the finest print ever printed i read what the * stood for:"if not past 10 pm. no extension of 30 min. exp 2/15/09." that's my boy! always infusing his one of a kind humor with his one of a kind romance. i love you, babe! hope everyone had a fantastic love day! i like Kirby's fine print... so cute!! you should make a book of all your fun crafty ideas for people to do with their kids. the girls are going to have so many fun memories! Mary is getting so big. I love the heart butter. Awesome!